We can build templates for you, but those might not really be what you need. The real form specialist is you! If a form is useful for you, it will also be valuable for other companies in your industry. So let's help each other saving paper, money, and time! In the MoreApp Marketplace next to widgets and hooks, you can also find forms that you can use. Do you want to share your form with others? 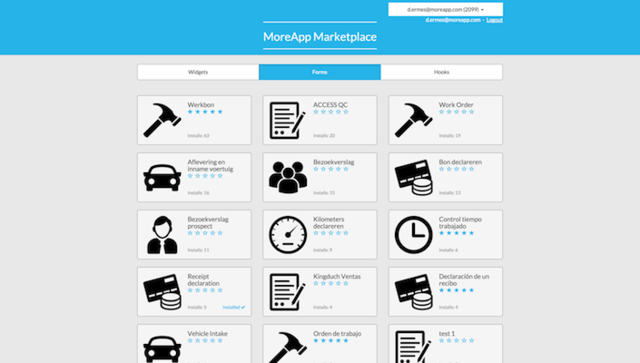 In order to add the form as a template on the MoreApp Marketplace, read our step-by-step guide on how easy it is. Additionally, you can rate the forms that you've installed with our 5 star rating system to let others know what you think. Some already took the first step! Our customers Kingduch from Mexico who offer their order form, our Dutch health care partner offers a request form for the doctors, and an inspection form from the US are already benefiting from our Marketplace. We will give 5.000 credits to the company with the first 100 installs! So don't waste time and share your forms!